Apparently due to Berthold Reimers, via Sheila Hamanaka. Click on image to open with a more readable size. We have received complaints about programming that may be threatening the financial and legal health of the Pacifica Foundation. Therefore, following legal advice, we are taking preparatory measures to secure our broadcast signals should we need to prevent legal liability as a last resort. These precautionary measures will be taken at all five stations under advice of Counsel. Pacifica is the license holder for all five stations and is ultimately responsible for everything broadcast over all of them. 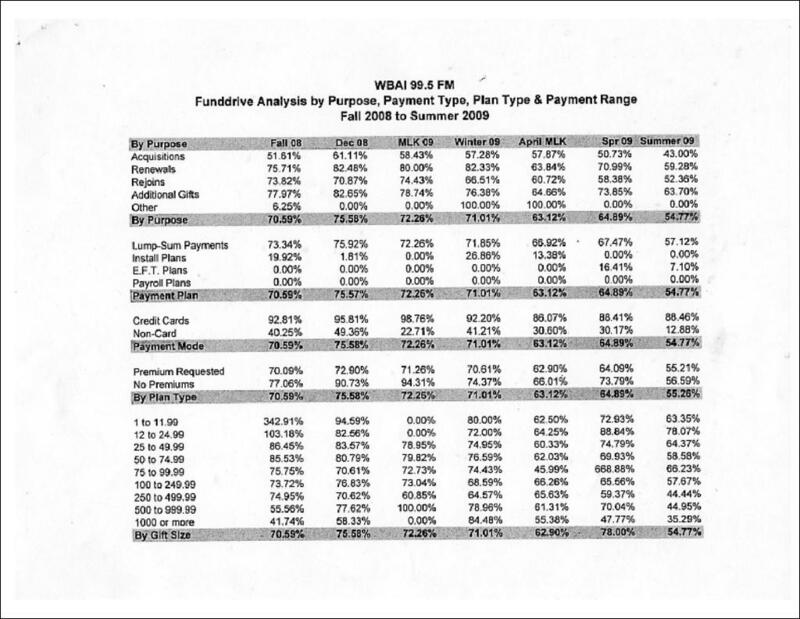 The PDF attached [below] is a chart of the declining pledge numbers at WBAI, 2004 - 2008. There had been some talk that the number of pledges had increased. This appears to have been wishful thinking and not correctly documented. There had also been talk that the amoung per pledge had declined. This is not shown in this particular chart (more to come), but that unfortunately appears to be accurate. PACIFICA FOUNDATION, a California corporation, d/b/a WBAI RADIO, CASEY PETERS and DALE RATNER, Defendants. The slate mailer sent to WBAI listener sponsors by the faction calling itself ACE (Alliance for Community Elections) has violated rules established by the Pacifica Foundations National Elections Supervisor. The same rules were followed by other organizations sending slate mailers. Sarv Randhawa (KPFA), Michael Woodson (KPFT), Lisa Davis (WBAI) and Dave Adelson (KPFK) are calling for a special meeting of the PNB, to be held by telephone, on Thursday, November 1st, at 5:30 p.m. PST [probably PDT -editor].